The main raw materials required to manufacture traditional, Ordinary Portland Cement (OPC) are limestone and clay. Rocks are extracted from a quarry by blasting and then routed to the nearby cement plant on a conveyor belt. The main raw materials required to manufacture Solidia Cement™ are a source of CaO (e.g., limestone) and a source of SiO2 (e.g., clay or sand). The minerals from the quarry are routed to the grinding plant where they undergo initial milling before being reduced to a fine powder. The raw materials (80% limestone and 20% clay for OPC) are then stored in a pre-homogenization pile. This mixture is called « raw mix ». The ratio of the raw mix components used to produce Solidia Cement clinker is different than that used in traditional OPC. In particular, Solidia Cement has a lower limestone content, which is balanced by a higher clay or sand content. For the production of OPC, the raw mix is fed into a preheating tower and then enters a horizontal rotary kiln heated to approximately 900°C. The temperature is then raised to 1450°C. Combustion causes a chemical reaction called “decarbonation,” which releases the CO2 contained in the milestone. The fired materials take the form of hard granules called “clinker”. The lower proportion of limestone in the raw mix used to produce Solidia clinker results in a significant reduction of CO2 emissions. The clinker of Solidia Cement is produced at a temperature of about 1200°C, which is roughly 250°C lower than the sintering temperature used in OPC clinker manufacturing. The resulting process emits 30% less CO2. Following re-cooling, the clinker is stored in silos, then transformed into cement according to production requirements. During the final manufacturing stage, gypsum is added to the clinker, in a proportion of 3-5%, and the mixture is finely ground. Solidia Cement does not require any additional materials. Conventional cementitious materials can be added to further reduce the CO2 footprint of the cement. The cement is stored in silos before being delivered in bulk using tanker trucks or packaged into 25-35kg bags and stacked on pallets. Various means of transport may be used according to the local infrastructure and topography. Since the market for construction materials is a local market, transportation distances are relatively short. At precast plant, the cement is stored in silos. 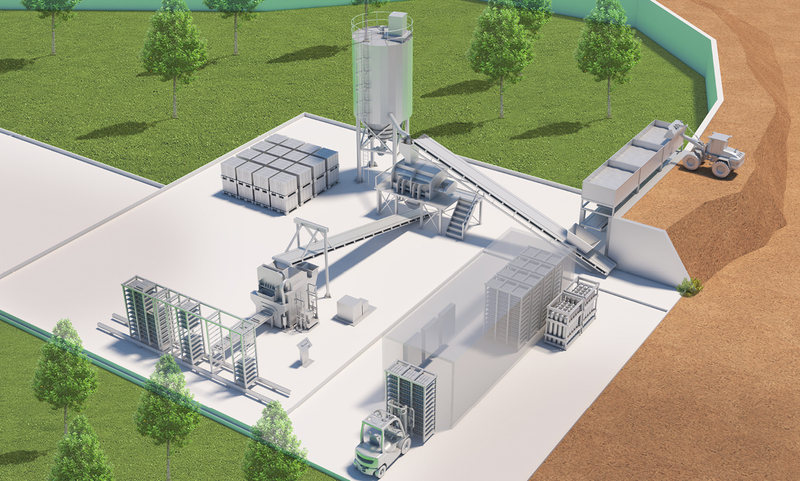 A dedicated cement silo is needed for Solidia Cement storage. Solidia Cement only reacts with CO2, unlike OPC, which reacts with water. Concrete raw materials are fed into hoppers and added to the mixer. Solidia Concrete™ uses the same raw materials as OPC. 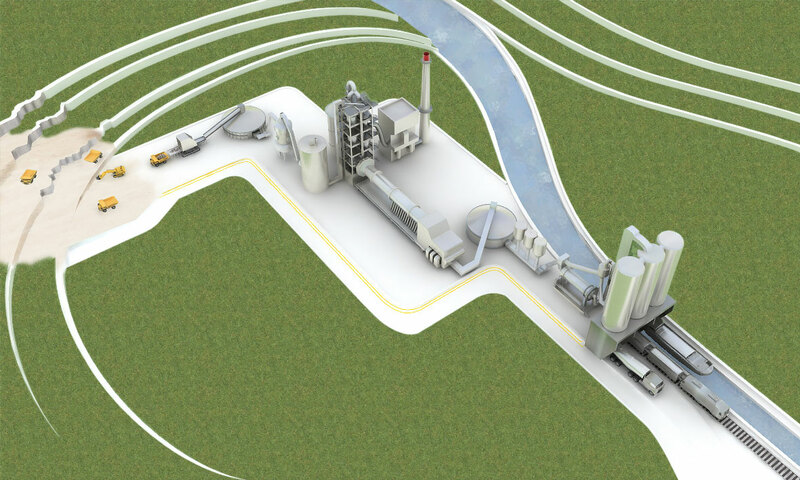 Raw materials, cement, water and admixtures are introduced and homogenized in the mixer. The same process is used to produce Solidia Concrete. Precast products are prepared in a press machine. The concrete is vibrated and packed in molds to create multiple pavers on a board. The boards are then stored on racks. The same process is used to produce Solidia precast products. Prior to carbonation, imperfect Solidia products can be broken up and recycled back into the mix to be reformed, reducing waste and saving money for precasters. Once prepared, the OPC precast products are cured in curing chambers at the specific temperature and humidity conditions needed to speed up strengthening and hardening. After a given time, they are taken out of the chamber. Solidia Cement only reacts with CO2, unlike OPC, which reacts with water. During the curing process, which uses the same temperature and humidity atmosphere as OPC, CO2 – from waste flue gas – reacts with Solidia Cement to form calcium carbonate. It is permanently transformed from a gas to a solid that resembles natural limestone. When the reduced CO2 emissions associated with Solidia Cement production are considered along with the ability of that cement to sequester CO2 during concrete curing, the carbon footprint associated with the manufacturing and use of cement can be reduced by up to 70% compared to OPC. This reduction is equal to 550 kg of CO2 per tonne of cement. OPC precast products can require many days to achieve full strength. Manufacturers store them during this process before they are sold and shipped. The CO2 curing process allows Solidia Concrete products to gain full strength in just 24 hours. Solidia’s precast products can be shipped immediately following the curing process, reducing the need for storage space and strengthening time, thereby saving manufacturers time and money.